This is the site of Bickerston village. 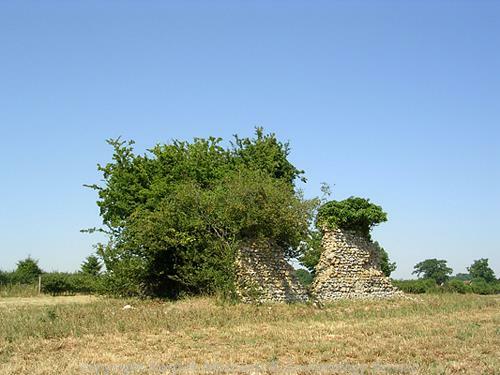 The settlement was mentioned in the Domesday Book and in 14th century documents but was abandoned later, possibly by the 17th century. The only visible remains are two walls from the chancel of the medieval St Andrew's church. Metal detecting in 1980 recovered a 14th century coin from within the church ruins. Remains of a deserted medieval village. (S1) noted and drew the church with a very small east window, one window in north and south chancel walls (apparently round-headed); the gable between nave and chancel; and the 'site of the tower'. He noted 'several large bricks like Roman, no freestone'. Ordnance Survey card states the church was used as a farm store as early as 1633. The village was mentioned in (S2). Nomina Villarum, thirteen tax payers in 1329, six in 1332, Black Death relief 1352-4. (S3) states that it stood 'by the river' but the exact limits are not known, and no traces were found on aerial photographs by Ordnance Survey inspectors. All that remains of the church are two short sections of wall about 2.5m high (north) and 2m (south); they appear to be the western end of the building. Both are of flint with some bricks that could well be Roman. The flint is coursed on both faces at the base of the wall but rough above apparently due to robbing - the opposite way round to usual. Rough embrasures of window in north wall, and possibly part of one in south. Stands on mound. Two bushes grow inside, and interior is also used as a wood store. No visible traces of village in this field (pasture), but see NHER 11907 etc. E. Rose (NAU) 5 November 1980. Found within church ruins. Hammered penny of Edward I, II or III York mint; struck off centre and clipped. S. Margeson (NCM) 1 December 1982. Church dedicated to St Andrew. Ruins are north and south walls of the chancel. D. Robertson (NLA) 20 July 2005. Field remains under grazed pasture, with no evidence of earthworks. Ruins of church, two short sections of wall (as in 1980). H. Paterson (A&E) 27 September 2005. --- Aerial Photograph: TG0808A, B, D-H.
--- Archive: Ordnance Survey Staff. 1933-1979?. Ordnance Survey Record Cards. TG 00 NE 1. --- Archive: Clarke, R. R. and NCM Staff. 1933-1973. Norwich Castle Museum Record Card - Medieval. Barnham Broom. <S2> Publication: Brown, P (ed.). 1984. Domesday Book: Norfolk. Parts 1 and 2. <S3> Serial: Blomefield, F.. 1805-1810. An Essay Towards a Topographical History of the County of Norfolk.. Unknown - USE SPECIFIC VOLUME WHERE KNOWN.